The AlunAlun Dance Circle continues to fulfill its mission of promoting intangible cultural heritage through the conservation and promotion of pangalay which is also known as igal and pansak among the indigenous groups of Southern Philippines. 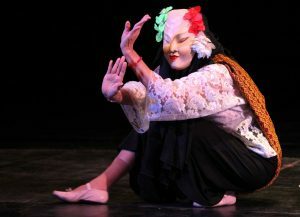 Ligaya Amilbangsa wearing mask in a performance at the CCP Little Theater on the occaion of ALAB NCCA in April 2016. Photo courtesy of NCCA. January 15, 2016. Pangalay Suite for the East West Center and the East West Center Alumni Association, Philippine Chapter. Venue was at the Pandanggo and Polkabal function rooms of the Manila Hotel, Roxas Boulevard. 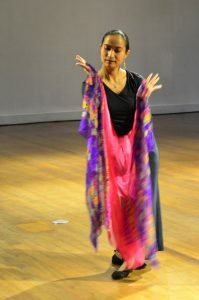 The production was made possible with Ligaya Amilbangsa as choreographer and dancer. Dancers: Nannette Matilac, Joy Ricote, Sarah Lumba, Mannex Siapno, Levi Azarcon, Sarri Tapales, and Lyn Literal; technical supervisor for music and visual projection: Milabel Cristobal. January 28, 2016. At the Dusit Hotel, the ADC graced the Launch of Demoncratic Party Development Bangsamoro (DEPAdev) sponsored by the European Union, the Konrad Adenauer Stiftung (KAS) Philippines Office and the Institute for Autonomy and Governance (IAG). The performers: Ligaya Amilbangsa, Nannette Matilac, Temay Padero, Lyn Literal, Mannex Siapno, and Levi Azarcon. February 5, 2016. De La Salle University (DLSU) invited the ADC to perform two shows under the Action Program of DLSU Culture and Arts Office. Each presentation started with the lecture-demonstration titled “What is Pangalay?”. The intention of the program is to provide informative and entertaining performances which will enrich the awareness of DLSU students about the arts. Each show lasted for 20 minutes followed by open forum and interaction with the audience. ADC members who participated in this worthwhile activity: Ligaya Amilbangsa, Louanne Calipayan, Punch Gavino, Temay Padero, Mannex Siapno, Lyn Literal with Milabel Cristobal as technical person. March 11, 2016. On the Occasion of Women’s Month 2016, the Barangay San Lorenzo and the AlunAlun Dance Circle (ADC) presented “Pangalay ng Bayan: Alay sa Kababaihan 2016, Celebrating Women Through Dance.” This was open to the public with venue at the Covered Court of San Lorenzo Village. It showcased ADC’s innovations to keep pangalay relevant and appealing to contemporary audiences. 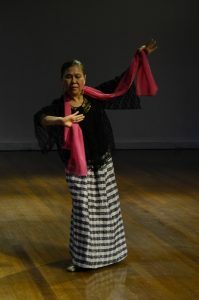 These include the use of masks, rhythmic sounds, improvised costumes, puppets, different types of musical accompaniment, and props, without losing the intrinsic character of pangalay. There was good interaction with the audience during the Open Forum after the performance. The ADC members who joined this show: Ligaya Amilbangsa, CB Garrucho, Louanne Calipayan, Mariel Francisco, Temay Padero, Milabel Cristobal, Lyn Literal, Mannex Siapno, and Levi Azarcon. Ligaya Amilbangsa’s portrait is one of the 30 portraits in FIlipinas Exhibit at the National Museum. 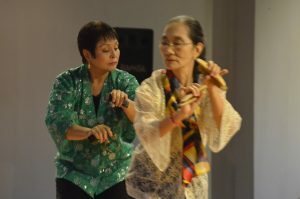 The militant song “Mga Babae” is danced with bula’bula using bamboo clappers, by CB Garrucho and Ligaya Amilbangsa. March 20, 2016. Original pangalay choreographies in harmony with the theme of Filipinas provided a fitting opening to the launch of the FILIPINAS exhibition at the 4th Floor of the National Museum (old Finance Building), 5 p.m. FILIPINAS photo exhibit features images of distinguished Filipino women by Isa Lorenzo which was first shown at the CCP in 2006. 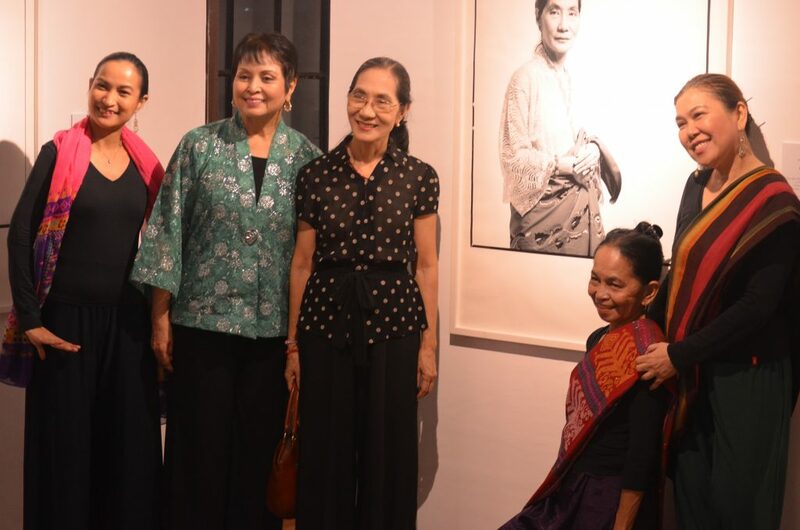 Ligaya Amilbangsa’s portrait is one of the 30 outstanding Filipinas. FILIPINAS was also exhibited at the UNESCO (Paris) in 2007 and at the Philippine Embassy in Brussels in 2008. Mannex Siapno in the performance at CCP. 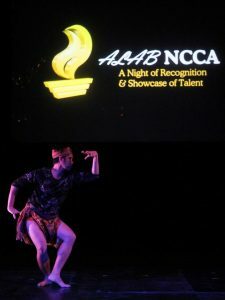 Jimo Angeles performs tawti in ALAB NCCA. April 28, 2016. 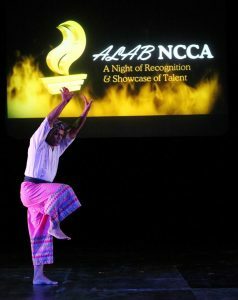 ALAB NCCA: The 29th Anniversary Recognition Night, described as “a night of recognition for the tireless cultural workers and a showcase of talent in celebration of the NCCA’s anniversary.” Ligaya Amilbangsa, with the ADC male dancers Jimo Angeles and Mannex Siapno, regaled the occasion with an innovative choreography. Venue was at the Little Theater of the Cultural Center of the Philippines, 5:00 pm. 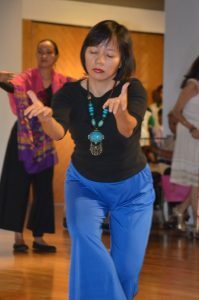 Below: The women of AlunAlun performing at FILIPINAS launch, March 20, 2016. Louanne Calipayan dancers with a scarf. Sarah Lumba dancing at the National Museum. April-May 2016. This marks the start of the project with Museum Volunteers of the Philippines (MVP). The volunteer organization gave a small grant to ADC to implement a project on preserving the craft of making traditiona garments among the Badjao. This is an important project because it aims to encourage the remaining artisans to continue their craft. Project runs until first quarter of 2017. 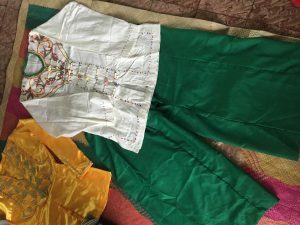 The project supported by the Museum Volunteers of the Philippines is valuable in giving incentives to local artisans to continue their craft of making native garments.